I hope you are having a wonderfully relaxing weekend. I've been having a ball, I've gotten some much needed crafting time. Lovin' it. 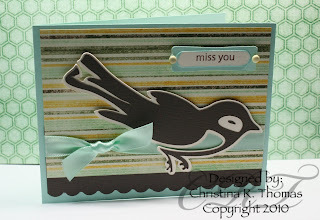 Today is a "Miss You" card using the Home Decor Cricut Cartridge. Supplies: Home Decor Cricut Cartridge, Oh la la pattern paper by My Minds Eye, Paper Trey Ink Aqua Mist Cardstock and satin ribbon, Paper Trey Ink Vintage Cream Cardstock, Bazzil Brown Cardstock, Fiskars Scallop Punch, SU! Word Window Punch, SU! Label Punch, My Pink Stamper Stamps, ATG Adhesive Gun. Another cute card. I think I have this cartridge..... I think I'll have to dig it out. What a cute card! Thanks for the tutorial! Very pretty colors and I love that bird!! What a cute card. I really love the colors. Love the color combination on this card. Those colors just make me feel happy. irishmist59.blogspot.com come and get it!! Great Card Christina. So Springy!! I didn't watch the video but thanks for reminding me again about the older carts. It's my goal to get to all of my carts and make something from each one of them. Love the card, simple and beautiful. Cute card and love the colors of the papers. very cute, Christina! Love the color combination and the bird. So perfect for spring. I love the colors too. I've never cut the birds on this cart. I can't wait to make this. Sweet card. Perfect for today. I think the birds are starting to come home. I love the way your bird turned out and the colors are very pretty. Christina thank you so much for all your videos. They are always so helpful and inspiring for me. I have left you a Sunshine Award on my blog http://deannaspapercrafts.blogspot.com. Thanks. What a PRETTY card!! Those are my FAVORITE colors together!! Another awesome job & video like always! Have a wonderful night my friend! Hi Christina! I have a beautiful blog award for you over on my blog! You'll have to stop by to grab it and read the rules! Congrats go out to you! I love your style and your blog is so fun to visit! I really like this card. I dont have that cartridge, but I think my friend does. gonna have to borrow it for awhile. OOOO and I have this cartridge! Thanks for all your videos, I've left something on my blog for you. Hi Christina. This cards is adorable!!! You are so creative. This is such a sweet card! Love the bird and appreciate the time you take to make videos! I so love your card! It makes me want Spring to arrive. Nice job on the video. I love the birds lately and really need to make some because I am really attracted to them lately. I like your card. It makes me think of the birds coming back in the spring...boy, I would love spring to get here. I have that cartridge so that means I have no excuse not to make that card. I just need to find the time. Thanks for the great videos! Very cute Card! Love the colors and your tutorial is great. Thanks for the inspiration. Love this!! Such a cute card. I have a blog too. I just started it, but would love for you to check it out. Very cute card, Christina! Love that aqua cardstock and I really want to get a word window punch. They look so handy! Thanks so much for sharing your hard work with us, and even sacrificing a nail in the process!! I just love this card! Beautiful! it amazes me how much just adding the brads can enhance a card. 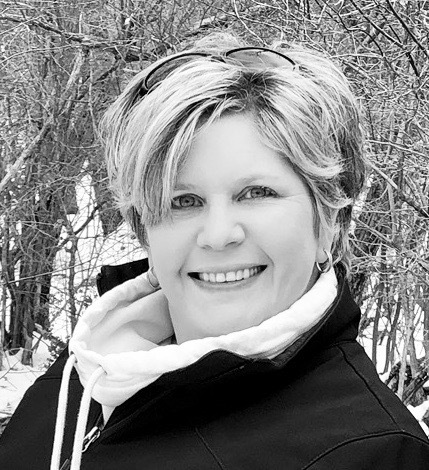 Hi Christina...I am new to your site. I love your videos. They are very helpful. What did you call the tool that you picked up the birds eye with? We have a Hobby Lobby here where I live and I want to get one of those tools. beautiful card! I just got that cart yesterday and can't wait to try it! also I'm new to your blog...came over from MPS. this is really cute, i love those colors, they look really nice together. Absolutely beautiful Christina!! Great job! Wonderful creation and thanks for the tip on the 3m tape. I spend way too much money on pop dots! I love the card but I have also been watching other videos and I love the grunge flower you made. It is beautiful!!! This is the first time I saw your blog but I'm now a follower and I look forward to more great things from you in the future. I found your blog from the pink stamper. See ya soon. I love the colours , what a beautiful card. Just found your blog from Pink Stamper to and I'm also a follower now . Pefectly simple and I love it! !